Time to lay aside all morals. Time to earn as much as I can without any regards for honesty, ethics and so on. 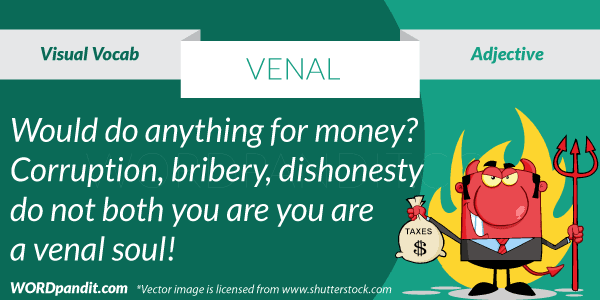 Venal acts are common, especially if you live in India. The picture above, depicting the custom officials , is one such example of a venal act in an almost endless list. 1. a. Open to bribery; mercenary: a venal police officer. b. Capable of betraying honor, duty, or scruples for a price; corruptible. 2. Marked by corrupt dealings, especially bribery. 3. Obtainable for a price. Just remember: Venal acts deserve penal replies. 1. The city administration is a venal one, seeped in corruption from top to bottom. What a neat website! I’d love to use it in my classroom. I love the visual images, however the grammar in the “venal” definition is incorrect.